Everyday Fray: From K - Blogathon Canada Giveaway Winner! Last week I was fortunate to be a host for Blogathon Canada, representing the province of Alberta. If you missed out on seeing all of the fabulous blogs who participated, you can read more about it here. 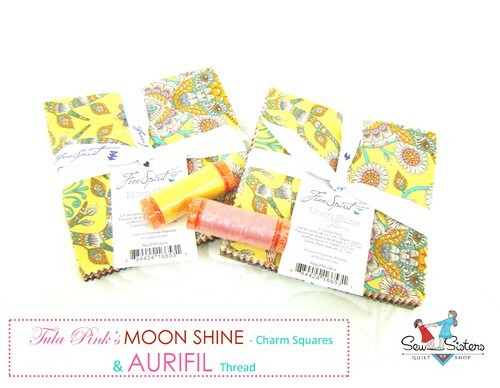 Sew Sister's generously sponsor a giveaway for one of our readers - two charm packs of Tula Pink's newest fabric line Moon Shine, as well as two spools of matching Aurifil thread! The contest closed last night, so we drew out of a hat and the winner is... Rebecca of Our Busy Little Bunch! Congratulations Rebecca, I hope you enjoy these charms! Sew Sisters will be mailing your prize. Please check your email so we know where to send it. Congrats to the winner and thanks you for hosting!